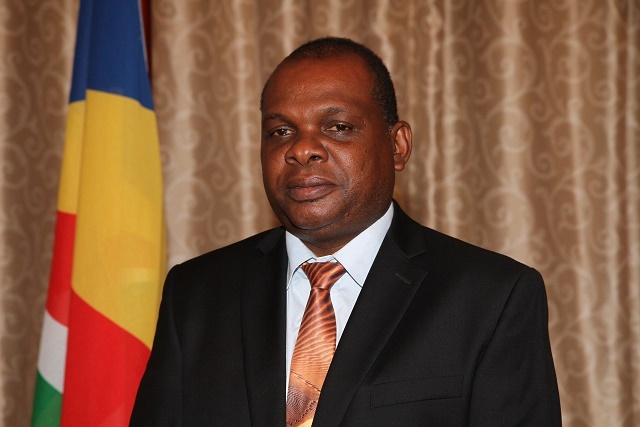 (Seychelles News Agency) - The Seychelles Minister of Environment, Energy and Climate Change, Didier Dogley, has said that he expects the country to meet its national target of producing 15 percent of its energy requirements from renewable sources up to a decade before schedule. The Seychelles Energy Policy for 2010-2030, which was completed in 2010, aimed to guide the Indian Ocean archipelago of 115 islands towards reducing its consumption of fossil fuels by 15 percent by the year 2030. The small island developing state, which relies mainly on tourism and tuna fisheries to sustain its small economy, is heavily dependent on imported diesel to run generators which produce the electricity required by the country’s 93,000 inhabitants and tourism establishments. But Minister Dogley is convinced that Seychelles should be able to meet that 15 percent target by 2020 – a little over four years from now. Currently, the minister said the archipelago is producing around 4.5 percent of its energy requirements from renewable sources, but is confident that 2016 will be a turnaround year for Seychelles’ renewable energy sector. “If everything goes well, by next year you will see a major difference,” said Minister Dogley in an interview with SNA. The island nation’s government has favoured a multi-pronged approach towards achieving its goal, with a wide range of different types of clean energy sources. The most visible of these renewable energy sources are the eight giant wind turbines near the port of Victoria, the archipelago’s capital, provided by Abu Dhabi-based energy company Masdar as a grant from the government of the United Arab Emirates. Officially switched on in 2013, the 6 megawatt (MW) wind farm now produces around 2.5 percent of the islands’ energy requirements, providing enough electricity to power around 2,000 homes. The wind farm alone has saved government an estimated $10 million dollars in imported diesel per year. Minister Dogley told SNA that the government would soon be inviting commercial renewable energy companies to install and run solar energy farms, and said a tender for the first farm of 5 MW would be advertised this October. He also revealed that government was currently in talks with the UAE government to build an additional solar farm, producing between 6 to 8 MW, on the empty ground beneath the wind farm’s turbines, on the reclaimed island of Ile de Romainville. A renewable energy rebate scheme from government also encouraged inhabitants to invest in photovoltaic (PV) solar panels for both residential homes and businesses. The PV units harvest solar energy, which is then sold back into the national power grid managed by the Public Utilities Corporation (PUC). 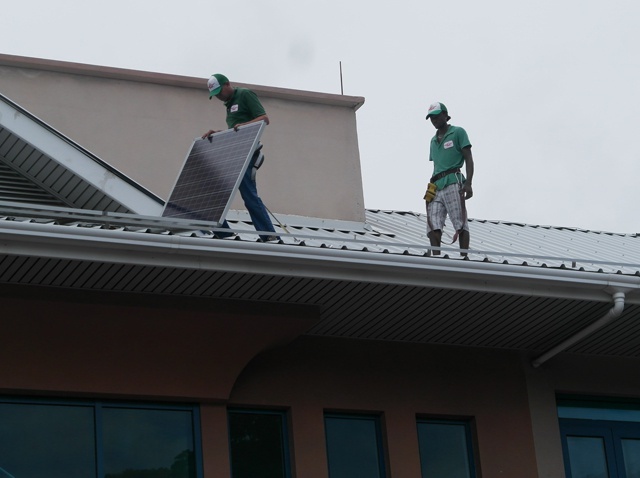 Aware of the prohibitive cost of buying and installing the PV systems, however, the Seychelles President, James Michel, announced in his annual National Day speech in June that the government would subsidise the purchase of PV systems for underprivileged homes. That scheme, known in government circles, as the ‘democratisation’ scheme, is due to start being implemented in the coming year, and is expected to amount for an additional 5 MW worth of renewable energy. All newly-built residential homes and businesses will also soon be required by the government to install PV panels. One of the new technologies being investigated for renewable in Seychelles is a cutting-edge one: harvesting energy from the ocean’s waves. 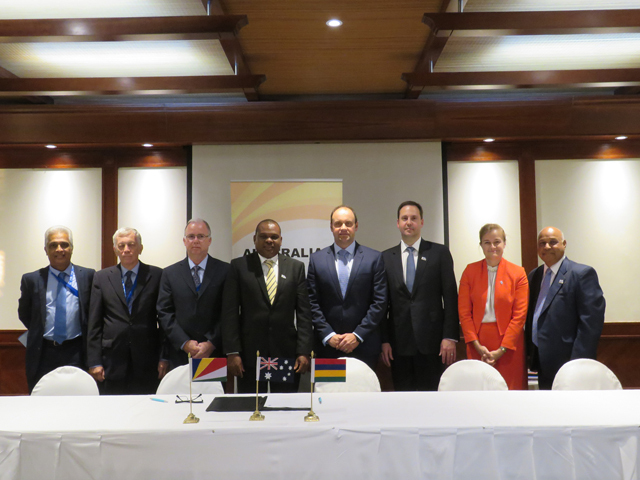 On September 3, Minister Dogley signed a Memorandum of Understanding (MoU) between Seychelles and Australian renewable energy company Carnegie Wave Energy Limited, on the margins of the first Indian Ocean Rim Association (IORA) Ministerial Conference on the Blue Economy that took place in Mauritius. Carnegie's CETO prototype operates under water where it is safer from the impact of large storms and invisible from the shore. According to Carnegie's website, the fully-submerged CETO buoys drive pumps and generators contained within the buoy itself, delivering power back to shore through undersea cables. The power can be used to directly power desalination plants or be exported into the grid. The company will be investigating commercial wave energy opportunities in the Seychelles after signing a similar agreement with Mauritius last year. According to Minister Dogley, Carnegie will be conducting thorough research before any decisions are taken. 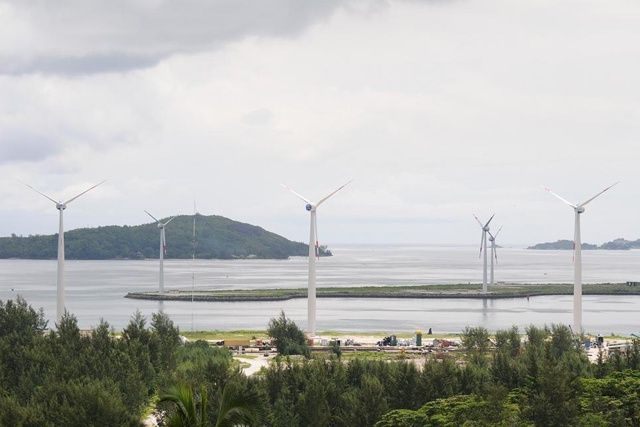 “Before we installed the wind turbines, the first thing we did was for a year we put an anemometer [an instrument that measures wind speed] to gather enough data to see whether it makes sense to have wind turbines in Seychelles,” he said. “So the same thing is going to be done with the wave energy; they will come and measure the amount of waves we have within the inner islands, and according to them, even if we have waves up to one metre, it’s enough for it to produce energy,” he elaborated. Minister Dogley said that if and when Carnegie was ready to invest in establishing a commercial wave plant, the government would negotiate with them and agree on the relevant tariffs. “Even if it’s a little bit more expensive [than burning diesel], there are two things that we need to look at: one is the… independence aspect, because when we had the piracy issue, remember the problems we had with tankers and ships trying to bring fuel to Seychelles? We had to buy it at a premium because the tankers had to pay a premium on their insurance to come into the Indian Ocean because of piracy,” Minister Dogley told SNA. The minister told SNA that once the goal of producing 15 percent of the country’s energy from renewables had been reached, some tweaks to the system would most likely be necessary to go above and beyond the target. The main problem, he explained, was that the grid may be unable to safely handle too much renewable energy production capacity due to the unpredictable nature of the elements. The Japan International Cooperation Agency (JICA) is currently conducting research on Seychelles’ current grid system and it is expected that by February 2016, a report will be made on how the grid can be adapted to a higher renewable intake level.